For the music journalist, see Mark Beaumont (journalist). Mark Ian Macleod Beaumont BEM (born 1 January 1983) is a record-breaking long-distance British cyclist, adventurer, broadcaster, documentary maker and author. He holds the record for cycling round the world, completing his 18,000-mile (29,000 km) route on 18 September 2017, having taken less than 79 days. On 18 February 2010 Beaumont completed a quest to cycle the Americas, cycling from Anchorage, Alaska, US to Ushuaia in Southern Argentina, for a BBC Television series. Beaumont was home-schooled until the age of 11 by his mother, Una. He was then educated at the High School of Dundee. At age 15, he completed a solo ride the length of Great Britain from John o'Groats to Land's End. He has a degree in politics from the University of Glasgow. He was awarded Graduate of the Year 2009 from the University of Glasgow, and won the 2010 Glenfiddich Spirit of Scotland Award. In 2012 he was awarded the degree of Doctor of Laws honoris causa from the University of Dundee. 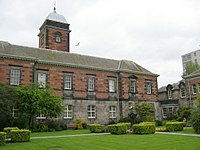 Beaumont was made Rector of the University of Dundee in January 2016. In the 2018 New Year Honours, Beaumont was awarded the British Empire Medal (BEM) "for services to sport, broadcasting and charity." In 2008, Beaumont successfully broke the world record for a circumnavigational bike tour of the World. To qualify for the Guinness world record Beaumont was required to travel an 18,000-mile route that passes through two approximately antipodal points. The route began and ended in Paris, France, riding through 20 countries across Europe, the Middle East, India, Asia, Australasia and North America. The bicycle used for the attempt was a Koga-Miyata with a Rohloff internal gearing hub. The bike was loaded with 66 pounds (30 kg) of equipment such as tools, cameras and other equipment to support him during the journey. The new record was set at 194 days and 17 hours beating the previous record of 276 days and 19 hours. Beaumont endured many hardships during his voyage. In Lafayette, Louisiana he was involved in a collision with a car and robbed later the same day, and elsewhere struggled with illnesses such as dysentery. As a result of breaking the world record, Beaumont raised £18,000 for charity. Beaumont's video diaries of the journey formed the basis of a BAFTA-nominated documentary, The Man who Cycled the World, which was broadcast by the BBC in August 2008. Beaumont's around-the-world cycling record was broken by Vin Cox on 1 August 2010. Beaumont regained the Guinness around-the-world cycling record in 2017 (see 'Around the World in 80 days' below). Beaumont cycled from Anchorage, Alaska, US to Ushuaia in Southern Argentina, arriving on 18 February 2010. In addition to cycling 13,080 miles (21,050 km) in 268 days, he climbed the highest peaks in North and South America: Denali and Aconcagua. Along with commenting online throughout the journey, he recorded the adventure for a BBC One documentary series, The Man Who Cycled The Americas. The first in the series of three episodes was broadcast on Tuesday, 23 March 2010 on BBC One. Beaumont bypassed Colombia and the Darien Gap on his journey. During Summer 2017, Beaumont completed a second global circumnavigation, similar to his first 10 years prior, known as the Around the World in 80 Days Artemis Challenge. The intention was to complete the trip in 80 days, inspired by the Jules Verne story Around the World in Eighty Days. A support team traveled with him on his journey, providing nutritional, mechanical and logistical support. His target was to cover approximately 240 miles (390 km) a day. He completed the journey one day ahead of schedule on 18 September, with a total time of 78 days, 14 hours, 40 minutes. This beat the previous around-the-world cycling record by 44 days. During the summer of 2011, Beaumont joined a team of six in rowing through the Canadian Arctic, as the BBC cameraman as well as on the oars. Their aim was to reach a 1996 location of the North Magnetic Pole. It is only in the last few years that the sea ice has melted enough for such a route to be attempted. In early 2012, Beaumont joined another team in an attempt to break the world record for rowing across the Atlantic Ocean. After 27 days and over 2,000 miles into the expedition, they capsized and had to be rescued. In addition to being an accomplished cyclist, Beaumont is a skier and rower. In June 2009, he planned to participate in a 12-strong team attempt to row across the North Atlantic in a record-breaking 45 days. The team would have been led by Edinburgh stockbroker turned adventurer Leven Brown whose 14-man La Mondiale crew had beaten the record from the Canaries to Barbados. However, the boat he was going to use sank in the Atlantic Ocean. Beaumont was the first torchbearer for day 26 of the 2012 Summer Olympics torch relay. In September 2012, Beaumont planned to lead the World Cycle Challenge – the first fully supported group circumnavigation of the globe, with the aim of cycling 18,010 miles (28,984 km) in 245 days. In May 2015, Beaumont set a new record in his "Africa Solo" challenge, cycling from Cairo to Cape Town in 42 days, and beating the previous record by 17 days. The bike he rode for this and the subsequent North Coast 500 challenge was a Koga Solacio which is on display at Edinburgh Airport. In November 2015, Beaumont set the record for completing the North Coast 500 (a 518.7 mile route around Scotland) by bicycle in 37 hours 56 minutes and 44 seconds. This effort was later beaten in 2016 by James McCallum, who completed the route in 31 hours. The Man who Cycled the World: A BBC documentary broadcast in August 2008. The content was based on Beaumont's video diaries of the journey. The documentary was nominated for a Scottish BAFTA. The Man Who Cycled The Americas: This BBC documentary was broadcast on 10 May 2010. ^ Debrett's biodata. Retrieved 17 May 2011. ^ "Media Release: Mark Beaumont team first over the line at the Artemis Great Kindrochit Quadrathlon". ^ "Mark Beaumont completes cross Scotland challenge". ^ Mark Smith (18 February 2010). "Scot completes his nine-month cycle from Alaska to Argentina". Heraldscotland.com. Archived from the original on 2 October 2012. Retrieved 19 September 2011. ^ "Old Pulteney Row to the Pole". Rowtothepole.com. Archived from the original on 23 August 2011. Retrieved 19 July 2012. ^ "Atlantic Odyssey: Exclusive first hand account of how a world record attempt ended in near disaster | Mark Beaumont | Independent Editor's choice Blogs". London: Blogs.independent.co.uk. 23 February 2012. Archived from the original on 29 July 2012. Retrieved 19 July 2012. ^ "Mark Beaumont breaks Africa cycling world record". BBC News. 21 May 2015. Retrieved 19 July 2015. ^ "Round the world cyclist Mark Beaumont in Morecambe". BBC News. 9 March 2010. Retrieved 15 May 2011. ^ "Dundee University names new rector". 18 September 2017. Retrieved 18 September 2017 – via www.bbc.co.uk. ^ "No. 62150". The London Gazette (Supplement). 30 December 2017. p. N26. ^ "Around the world cycling record". Wikipedia. ^ "BAFTA Nomination for David Peat's documentary". Bafta.org. Retrieved 19 September 2011. ^ Jamieson, Alastair (1 August 2010). "British man sets new round-the-world cycle record". The Daily Telegraph. London. ^ "Artemis Around the World in 80 Days Challenge". artemisworldcycle.com. Retrieved 4 August 2017. ^ "Cyclist Mark Beaumont targets around the world in 80 days". BBC News. 3 April 2017. Retrieved 3 April 2017. ^ "Artemis Around the World in 80 Days Challenge: About the Challenge". artemisworldcycle.com. Retrieved 4 August 2017. ^ a b "Cyclist Mark Beaumont breaks around the world record". BBC News. 18 September 2017. Retrieved 18 September 2017. ^ "Officially made it round the world". Mark Beaumont (via Twitter). Retrieved 18 September 2017. ^ "Artemis World Cycle - Live Tracker Map". www.artemisworldcycle.com. ^ from Edinburgh's Evening News. Retrieved 20 December 2008. ^ "Cycling hero Mark takes on the Americas". the Scottish Sun. 13 May 2009. Retrieved 19 September 2011. ^ "In pictures: Olympic torch relay day 26". BBC News. 13 June 2012. ^ "The World Cycle Challenge". ^ Chris Marshall-Bell (22 May 2015). "Mark Beaumont sets new Africa cycling world record". Cycling Weekly. ^ David Arthur (10 April 2015). "Mark Beaumont's Koga Solacio for Cairo to Cape Town record attempt starting today". road.cc. ^ "Watch: Mark Beaumont's epic non-stop ride around the north of Scotland". Cycling Weekly. 6 November 2015. ^ "Cyclist James McCallum demolishes Mark Beaumont's North Coast 500 record". Edinburgh Evening News. 20 June 2016. ^ "BBC One – The Man Who Cycled the Americas". Bbc.co.uk. 10 May 2010. Archived from the original on 27 January 2012. Retrieved 19 July 2012. ^ "The Man Who Cycled The World: Amazon.co.uk: Mark Beaumont: Books". Amazon.co.uk. Retrieved 19 July 2012. ^ "The Man Who Cycled the Americas: Amazon.co.uk: Mark Beaumont: Books". Amazon.co.uk. Retrieved 19 July 2012. ^ "Africa Solo: My World Record Race from Cairo to Cape Town: Amazon.co.uk: Mark Beaumont: Books". Bantam Press; UK ed. edition. Retrieved 27 August 2017. Wikimedia Commons has media related to Mark Beaumont. This page was last edited on 15 February 2019, at 20:07 (UTC).